Lenovo introduced two product updates prior to the CES in Los Angeles this year. 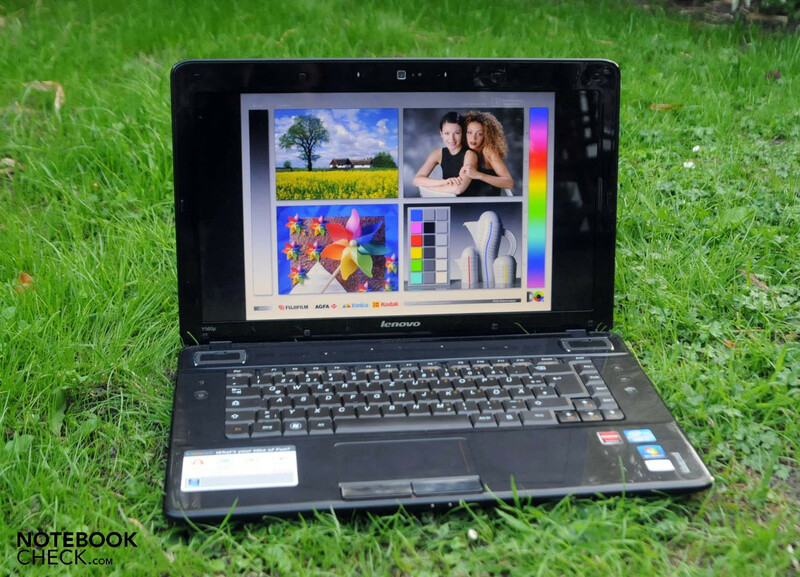 Besides the Lenovo IdeaPad Y460p with a 14 inch display, the notebook manufacturer also presented the model, Y560P. In addition to design modifications on the 15.6 incher, the technology has also been revised. The IdeaPad Y560P M61G3GE model which we reviewed has the quad core processor, Intel Core i7 2630QM with a clock rate of 2 GHz per core. An AMD Radeon HD 6570M is responsible for the video performance. Intel's Core i7 720QM with a clock rate of 1.6 GHz and an ATI Mobility Radeon HD 5730 was used in the prior model, IdeaPad Y560. Additional features are a built-in DVB-T TV tuner and speakers from the label, JBL. Upon hearing the initial facts, the product sounds like a real multimedia power bundle. However, that is only one side of the coin. In the following review, you will find out more about the pros and cons of the Lenovo IdeaPad Y560P M61G3GE. Lenovo's IdeaPad Y560P makes a very elegant first impression. The display lid is made of brushed metal. As usual, the company's name in glossy silver plastic is found on it. The other case parts are made of plastic. If you don't care for fingerprints on the work surface, you'll have problems with this device. The work surface is glossy and thus a magnet for fingerprints. Therefore, a cloth should always be kept within reach for removing these marks. The surface around the keyboard only yields slightly for the most part. The case can merely be dented stronger above the DVD drive. The keyboard's keys can also only be dented more intensely in the optical drive's area. It looks different on the laptop's base plate. The plastic bottom partly yields very intensely, which is also due to the numerous vents. The display lid can only be dented stronger towards the center. Moreover, the lid or better said, the surface can be twisted laterally. The hinges don't hold the display as tight as you would like. The display teeters for a few seconds after adjusting the angle. Lenovo's IdeaPad Y560P sits securely on the table and doesn't slip thanks to the rubber feet. The weight of about 2.7 kilograms will also certainly have a part in this. The dimensions of 33mmx385mmx225mm (height x width x depth) aren't anything exceptional. The interface options on the IdeaPad Y560P aren't exactly the newest. For example, you won't find a USB 3.0 port. Merely three ports of the prior generation have been installed. A VGA for external monitors and a HDMI interface are found on the notebook's left. Additionally, there is a gigabyte LAN port, two USB 2.0 ports and a line in and line out socket. 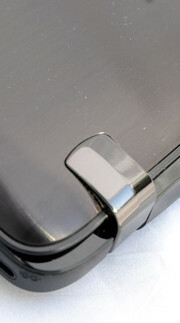 The right offers another USB port and an eSATA/USB combination besides a Kensington lock preparation. An ExpressCard slot also finds its place here. The rear doesn't bid any further connections. In return, the laptop's front differs from that with a memory cardreader for SD, SD Pro, xD, MS, MS Pro and MMC formats. There are three different possibilities to link up to other devices, respectively networks. As mentioned in connectivity, Lenovo's IdeaPad Y560P has a Broadcom NetLink Gigabit Ethernet. Intel's WiFi Link 1000 BGN (b/g/n) is available for wireless communication. Apart from that, Bluetooth is also installed, but unfortunately only in the 2.1 +EDR version. A DVB-T tuner from Avermedia is built into the notebook. The matching antenna is also included. Regrettably, it was too weak to receive signals in our location in Hamm, Westphalia, Germany. Hamm is not yet covered by digital TV so that an outdoor antenna is required. Lenovo offers quite a bit of optional supplies. The battery can also be recharged in the car with an AC/DC combo adapter. The IdeaPad USB port replicator bids five USB 2.0 ports, a DVI-I monitor interface, a DVI-VGA adapter, a stereo audio socket and an integrated Ethernet and cable lock slot. Finally, Lenovo also offers a remote control including keyboard. The alleged range is up to 10 meters. Lenovo grants a 24 month warranty on its notebook. Beyond that, there is a warranty extension available. Nothing has changed on the keyboard or on the touchpad. 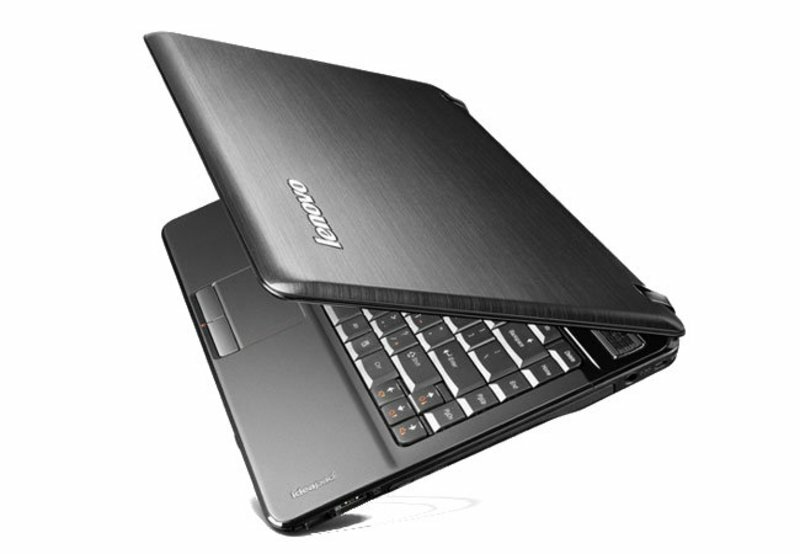 Therefore, we can refer to our evaluation in the review of the Lenovo IdeaPad Y560. The screen is the system's biggest weak point. The 15.6 inch display only manages a maximum resolution of 1366x768 pixels. The HD display comes with a 16:9 format. So far, everything is within an acceptable range. But now for the negative points: The display is reflective so that you can frequently look at yourself in the screen. The contrast of 192:1 also speaks for itself. 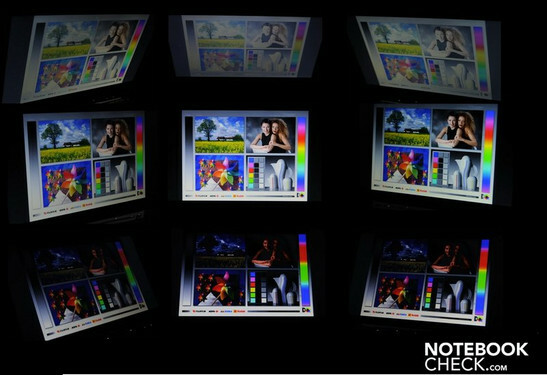 We measured the display's brightness with Datacolor's Mavo Monitor. LEDs are responsible for the background illumination. They only light up the screen to 163.6 cd/m2 on average. At least it's illuminated evenly. We measured 167 cd/m2 at the brightest spot, while the darkest accomplished 157 cd/m2. This display's outdoor suitability is very limited. The low brightness, and especially the glossy display, make using the system outdoors almost impossible. Nothing can be seen in direct sunlight. You can work with the display to an extent in the shade. However, it gets very strenuous after a while. The viewing angle stability is also unsatisfying. Overall, we are dealing with a very poor display, with the model AUO22EC. As mentioned above, a quad core processor is used in the Lenovo IdeaPad Y560P. The quad core processor, Intel Core i7-2630QM, is based on the Sandy Bridge architecture. The base clock of the single cores is 2 GHz and is accordingly higher by 0.4 GHz than in the prior model with an Intel Core i7 720QM. The clock rate can be increased once more in the Turbo Boost mode. A clock rate of 2.6 GHz can be achieved with all four cores simultaneously and the processor manages a whole 2.9 GHz with only one core. These rates can however only be accomplished within a specific temperature range. 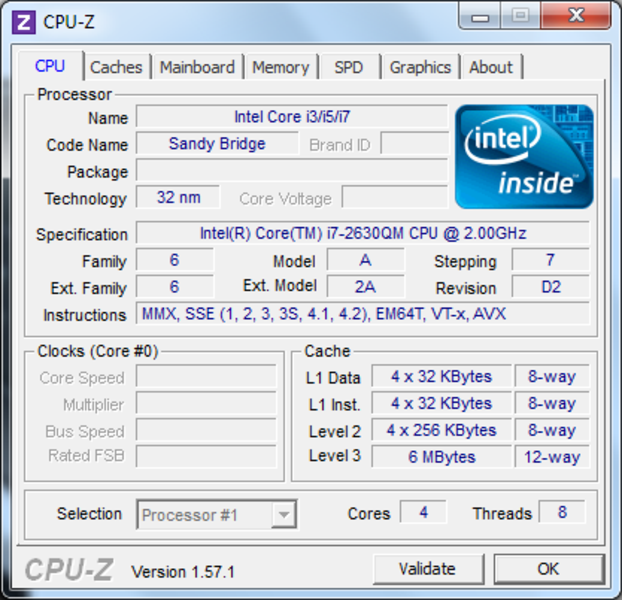 The improved Sandy Bridge architecture also bids the new 256 bit AVX Instructions in addition to Turbo 2.0. 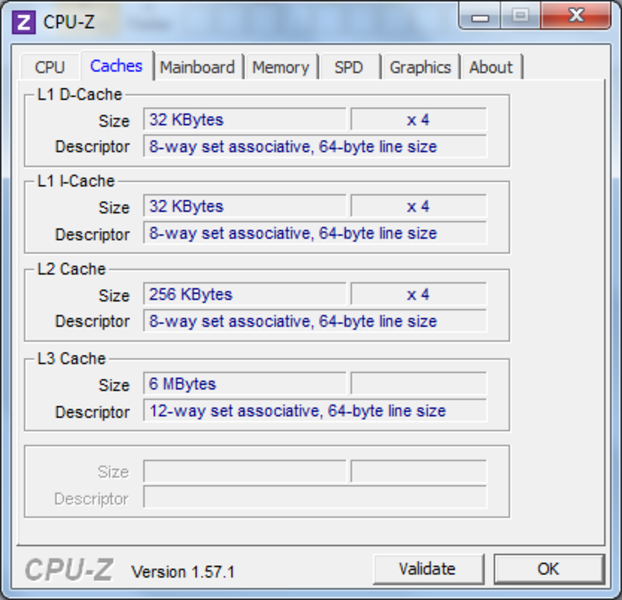 The 64 bit CPU has a 6144 KB L3 cache available. The maximum power consumption (TDP) is 45 watts. The graphics card is a dedicated graphics chip. Lenovo opted for the AMD model, the Radeon HD 6570M in this case. The graphics card supports DirectX 11, Shader Model 5.0, OpenGL 4.1, OpenCL 1.1 and DirectCompute 11. Games, such as Fifa 11, should run smoothly in maximum quality. The quality level will have to be reduced a bit for demanding games so that they will run smoothly. The Intel Core i7-2630QM processor had to first show its performance in the benchmark tool, Cinebench. Here, the Intel quad core processor excelled all the way through. It achieved a whole 17107 points in Cinebench R10 Multi Rendering (64bit) and thus lines in at the very top of our test database. Only the Asus N53SV with an Intel Core i7-2720QM processor (19601 points) or the ThinkPad W520 from Lenovo with an Intel 2820QM processor (19991 points), among others, achieve a higher score. Merely the Medion Erazer X6813 (MD97762) and the Dell Inspiron Queen Q15R are superior with the same processor. The results are confirmed in Cinebench R11.5. Our test device reaches 4.9 points in the CPU test here. Even the other test units with the same processor are within this range. Apple's MacBook Pro with an Intel 2720QM processor only has a slight lead with 5.2 points. The Asus N53SV HD3000 with an Intel Core i7 2720QM had a bigger lead with 5.6 points. We test the Lenovo's application performance with PCMark Vantage and this month's newly released benchmark tool, PCMark 7. Our test model again places itself in the test database's upper third with a total score of 6996 points in PCMark Vantage. Asus' G73SW-TZ083V, equipped with an Intel Core i7 2630QM and GeForce GTX 460M accomplished 7847 points. The configuration is sufficient for a score of 2137 points in PCMark 7. The possibilities for comparison are still rather slender here. The Alienware M14x, also with Intel's Core i7 2630QM and the GeForce GT 555M graphics card (3395 points), is currently at the top of this database. We check the AMD Radeon HD 6570M graphics card with the 3DMark range. 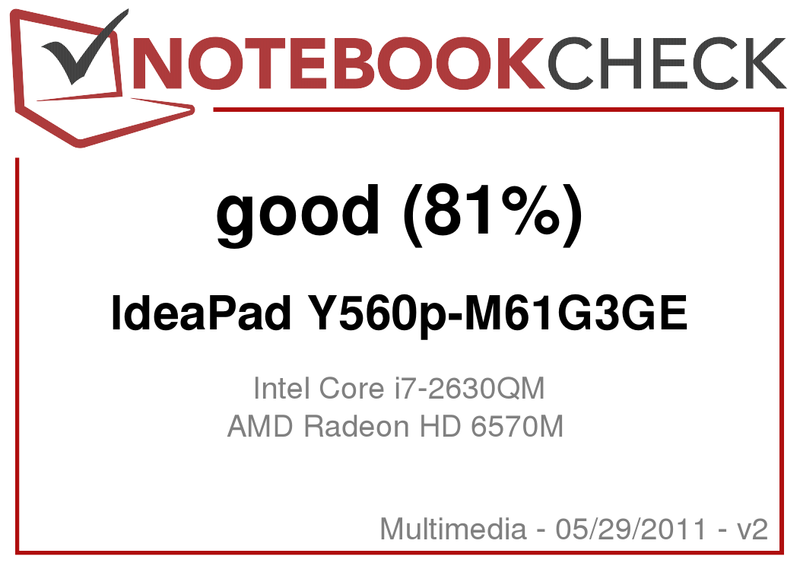 Lenovo's IdeaPad Y560P-M61G3GE places itself in the upper midfield with a score of 7553 points in 3DMark 06 with a resolution of 1280x1024. 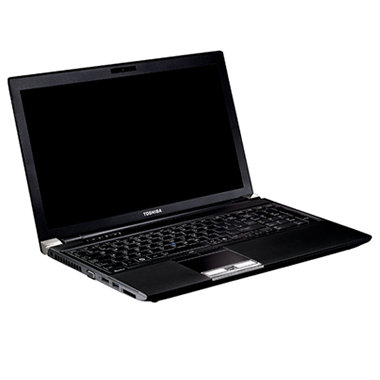 Acer's Aspire 5750G-2634G64 achieved 8011 points with the same processor and the GeForce GT 540M for the graphics card. Since the AMD Radeon HD 6570M graphics card also supports DirectX 11, it was possible to test it with the latest 3DMark 11 version, as well. The graphics chip is also located in the midfield with 1067 points in the GPU benchmark. Dell XPS 17-L702X, also with the same quad core processor but with a GeForce GT 555M, is a bit better with 1299 points. Lenovo equips its IdeaPad Y560P with a big 750 GB hard disk from Western Digital. However, the 2.5 inch hard disk only rotates with 5400 revolutions per minute and thus has losses in speed. This can also be seen in our test with HDTune. The average transfer speed is 76.5 MB/s. This rate isn't bad and the hard disk ends up in the midfield with it, but the performance would increase considerably with 7200 revolutions per minute (like in the prior model). We tested the laptop's gaming capabilities with five games. Undemanding games, such as Fifa 11, can even be played smoothly in the highest details. Our five games run smoothly even in a high detail level and a resolution of 1366x768 pixels. It only gets critical in Battlefield: Bad Company 2 with 32 frames per second. Games like Dirt 3, Call of Duty: Black Ops or Mafia 2 first become unplayable in an even higher resolution (tested in 1920x1080 pixels by us) which isn't an option for the built-in screen. The fans of Lenovo's IdeaPad Y560P already run in low load and partly even in idle. We measured the noise with the Voltcraft sl-320 at a distance of 15 centimeters. It was still a fairly quiet 33 dB(A) in idle. The system started to clearly attract attention while rendering a DVD. Our noise level was 37.3, which is already a bit disturbing. The fan rotates even faster during full load. The laptop reaches a noise level of 42.4 dB(A) during high load. This rate can already be described as disturbing. The temperature development on the laptop's surface is pleasant in idle. The notebook reaches a maximum of 25.1 degrees Celsius, respectively 26.7 degrees on the bottom. These rates can be seen positively. The notebook gets a lot warmer during load. The top's maximum temperature is 43.6 degrees here. A temperature of 47.8 degrees is even reached on the bottom. However, an average temperature of 30.8 degrees can be measured on the top and 32.8 degrees on the bottom. We pushed our test device to its limits in a stress test over several hours with Prime95 and Furmark. No problems turned up during this. The processor remained slightly below the specified maximum (a maximum of 93 degrees Celsius according to CPUID Hardware Monitor), and the GPU stayed within an acceptable range with a maximum of 81°C. The built-in speakers from the company, JBL, definitely belong to one of the Lenovo IdeaPad Y560P's highlights. The almost 4 cm wide speakers from the American manufacturers could fully convince us in the test. Naturally, there is always room for improvement, but more often than not you are used to a poor quality in notebook speakers. The speakers support Dolby Home Theater and thus supply virtual 7.1 surround sound. The JBL speaker's bass could be a bit more defined. There is a line in and line out jack for audio connections available. But there's nothing standing in the way of DVD or music entertainment with the brand name speakers. Unfortunately, it's not possible to accomplish long battery runtimes with the Lenovo IdeaPad Y560P. The lithium ion battery achieves a maximum battery runtime of 4 hours and 21 minutes in BatteryEater's Reader's Test. Our surf test is a bit closer to real life. We set the display brightness to an agreeable level and surfed around on the Internet. The battery only lasted for 3 hours and 8 minutes. The battery life is even shorter in DVD rendering. Entertainment comes to an end after 2 hours and 35 minutes. This is enough to watch a whole DVD without a power socket. The battery doesn't even last for an hour during full load. BatteryEater's Test was finished after 58 minutes. The IdeaPad Y560P's power consumption is, as expected in view of the battery performance, quite high. 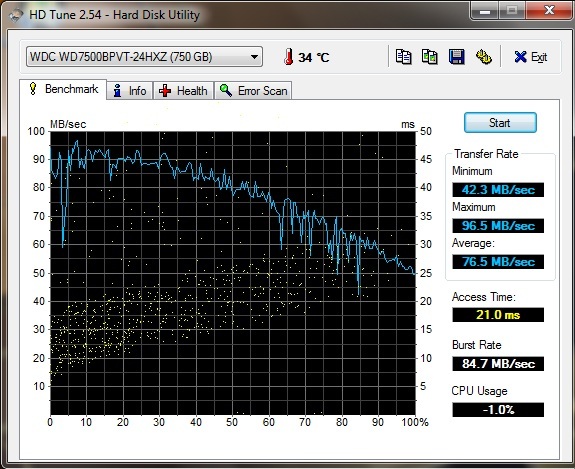 The multimedia notebook consumes a full 20.1 watts on average in idle mode. The power consumption increases many times over during load. Lenovo's laptop guzzles up to 114 watts, which also results in the low battery runtime of not even an hour. The Lenovo IdeaPad Y560P has one big weak point that pulls the whole (good) notebook down – the display. There have been massive cutbacks made on the 15 incher here. The display is reflective and definitely not bright enough for a multimedia notebook. A mobile use is also only possible to an extent due to the weak battery runtime. The Lenovo IdeaPad Y560P's system performance and its JBL speakers are impressive. The laptop's main feature, the Core i7-2630QM, was fully convincing with its four cores. The AMD Radeon HD 6570M graphics card is sufficient for current games, providing you reduce the detail level and resolution a bit. 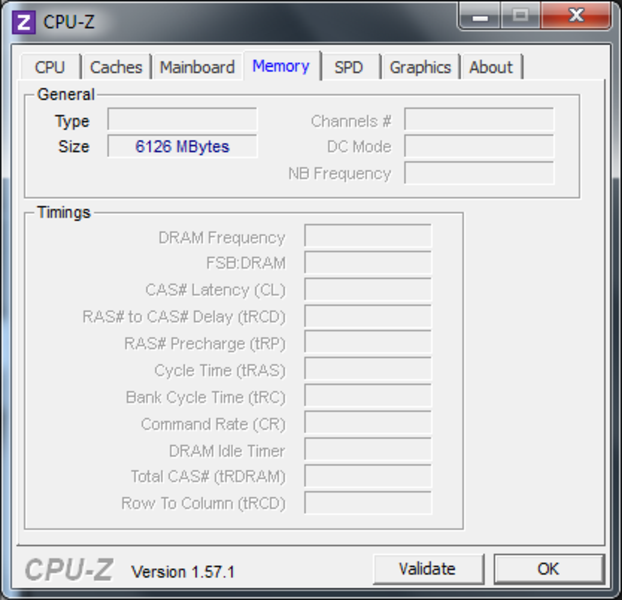 The installed six GB DDR3 RAM are absolutely sufficient. A nice feature is the installed DVB-T tuner. Cutting edge interfaces, such as USB 3.0 or the latest Bluetooth version, aren't found, though. The price of almost 800 euros is nevertheless a clear challenge. If you don't need long battery runtimes and can cope with a weak display, you'll get a strong multimedia notebook for a small price. 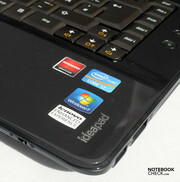 The logo "IdeaPad" lights up in use. The company name on the lid is naturally also present. The golden socket belongs to the DVB-T tuner. The display lid of brushed metal looks elegant. A 1.3 megapixel webcam is installed into the display bezel. The touchpad and its keys are quite big. Nothing's changed on the keyboard in comparison to the predecessor. You can already see how intensely the display reflects in this picture. The base plate has many vents. The sticker asks: "What's your idea of fun?" A good amount of computing power is behind the elegant design. The loudspeakers, from the brand name JBL, are convincing. A viable display and a bit more battery capacity wouldn't harm the Lenovo IdeaPad Y560P. How a principally good laptop can be degraded by installing a cheap display.